Source: film society lincoln center. Chrissie brings us this latest screening news. 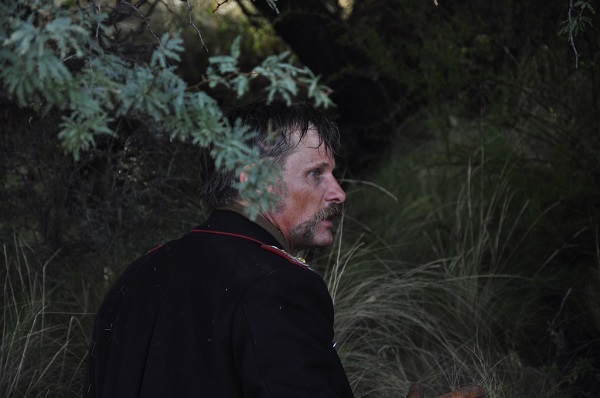 YFF's 2014 Filmmaker in Residence Lisandro Alonso's latest film, Jauja, starring Viggo Mortensen as an Argentinian officer in the 1870s searching for his missing daughter, will have its U.S. debut. The film won the FRIPESCI prize at this year's Cannes Film Festival. Tiff has just announced their latest list of films and Jauja now has a page on TIFF.net. It will be appearing in the Wavelengths section of 'daring, visionary and autonomous voices. Films that expand our notions of cinema'. "In the dazzlingly ambitious new film from Argentinian auteur Lisandro Alonso (Los Muertos, Liverpool), a 19th-century Danish general (Viggo Mortensen) undertakes a gruelling physical and metaphysical journey when he pursues his runaway daughter into the rugged wilderness of Patagonia." Where in the World is Viggo Mortensen? Viggo has a busy schedule in the month of September. Here are some key dates for him ... and us. Viggo will attend August 31 and September 1. Viggo will attend on September 9 through September 11. Although NOT associated with the NYC Film Festival, Viggo will be in New York City for events on September 14 through September 17. WE URGE CAUTION. We are not sure what the events will consist of at this point, and we certainly remember times when some of his events were by invitation only and that fans who traveled to NYC for them were disappointed. So ... before you make any travel plans, let us see what we can find out about the events and access. Stay tuned on this one. © viggo-works.com. Images © Venice Film Festival, TIFF.